If you need to set accessibility options -- to use the numeric keypad for mouse control, for example -- you can open the Control Panel and choose Accessibility Options, if that's what you're used to. 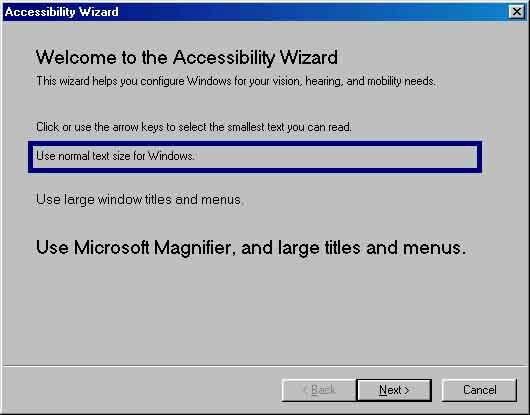 Windows 98 offers a better choice, however: the Accessibility Wizard, which will guide you through these options. The Accessibility Wizard doesn't install by default. To see if it's installed (or to launch it), choose Start/ Programs/ Accessories/ Accessibility/ Accessibility Wizard. If you don't see an Accessibility choice on the Accessories menu, you can install it by choosing Start/ Settings/ Control Panel and selecting Add/Remove Programs and then the Windows Setup tab. Select Accessibility, choose the Details button, and add a check to the Enhanced Accessibility option. (The Accessibility Options choice installs by default, but you should add a check to it if it does not have one.) Click OK, then OK again. Windows will ask you to put the Win 98 CD-ROM in your disk drive and will install the enhanced accessibility feature.